How to record facecam and gameplay at the same time. To record your webcam stream simultaneously with the game / screen recording (Picture-in-Picture, Video-in-Video), check the "Add webcam overlay to video" option as shown below. The webcam stream will be recorded and merged within the main video. Bandicam can record webcam videos and save them as video files (AVI, MP4). It also allows you to record the webcam stream to the main video (Picture-in-Picture, Video-in-Video). Bandicam offers the best Webcam Recording experience. If you use a laptop or desktop PC which has a webcam device, you will be able to see/capture the realtime webcam screen by using the 'Device Recording' mode of Bandicam. The 'Device Recording' mode allows you to record external webcam devices (hardware) with a high compression ratio and in high quality. Please, follow the steps below for high quality Webcam recording. 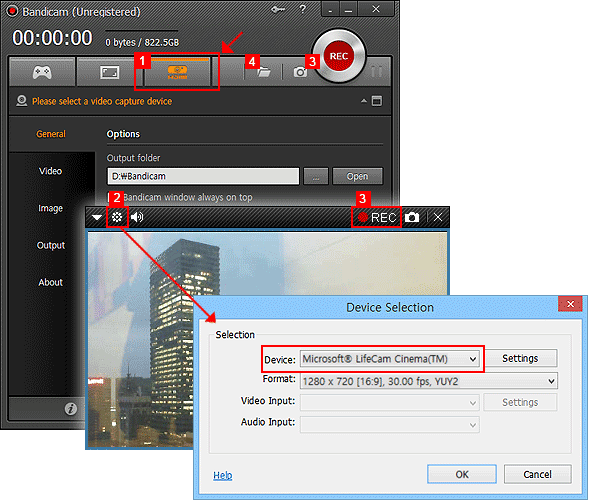 1 Download Bandicam and choose "Device Recording" mode of Bandicam. 2 Click the "Device Settings" button, and select the device you want to record. 3 If you can see the screen of the device, click the [ ● REC ] to start/stop the recording. 3 - If you can't see the screen of the device, install a device driver and select another video size at the 'Format' menu. 4 Click the 'Open' button to check the captured videos. 1. If you can't capture the screen through a capture device, please install a suitable device driver and select another video size at the 'Format' menu. 2. If you have a USB capture device, please plug the device into a USB 3.0 slot.